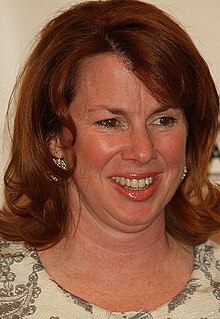 Siobhan Fallon Hogan (born May 13, 1961) is an American actress and comedian. She appeared in films such as Men in Black, Forrest Gump, The Negotiator, Holes, Daddy Day Care, Going in Style, and The House That Jack Built. Fallon was born in Syracuse, New York, United States, the daughter of Jane (née Eagan) and William J. Fallon, an attorney. She was raised Catholic, and is of Irish descent. She graduated from Le Moyne College in 1983. She made her television debut in an episode of The Golden Girls in 1990. She appeared in 20 episodes on Saturday Night Live from 1991 to 1992. She also appeared in three episodes of Seinfeld as Elaine Benes' annoying roommate Tina. Thereafter, she began to appear in feature films. In 2000, she shared the screen with Bjork in Dancer in the Dark by Lars von Trier, as her character's sympathetic jail guard on death row. She also is featured on the soundtrack Selmasongs by Bjork, dueting on the track 107 steps. In 2003, she appeared as Mrs. Yelnats in the film Holes with Sigourney Weaver and Shia LaBeouf. She appeared in New in Town, released on January 30, 2009, with Renée Zellweger and Harry Connick Jr.
Siobhan Fallon is a member of the Atlantic Theater Company. She had been a resident of Middletown Township, New Jersey and also has a summer home in Cazenovia, New York, a town outside Syracuse, where she grew up. A resident of Rumson, New Jersey, Fallon is married to commodities trader Peter Hogan and they have three children: Bernadette, Peter, and Sinead. Fallon was the speaker at the 2003 Cazenovia High School commencement. ^ "Siobhan Fallon - Biography". Netglimse.com. Archived from the original on 2011-09-28. Retrieved 2012-09-15. ^ "Siobhan Fallon Hogan". IMDb.com. Retrieved 2012-09-26. ^ "Divine Comedian: Siobhan Fallon Hogan". USCatholic.org. 2012-01-13. Retrieved 2015-06-06. ^ "William Fallon Obituary - Syracuse, NY | Syracuse Post Standard". Obits.syracuse.com. Retrieved 2015-06-06. ^ "Faith and Hollywood: Interview with Siobhan Fallon of the Movie 'New in Town' - Living Faith - Home & Family - Catholic Online". Catholic.org. 2009-01-25. Archived from the original on 2013-07-01. Retrieved 2012-09-15. ^ "CUA Magazine". Cuamagazine.cua.edu. 2009-07-29. Retrieved 2012-09-15. ^ "Siobhan Fallon biography". Starpulse.com. Retrieved 2012-09-26. ^ "Siobhan Fallon". Filmreference.com. Retrieved 2012-09-26. ^ Chesek, Tom. "'09 Basie Awards bring out best of high school shows", Asbury Park Press, May 23, 2009. Accessed January 22, 2011. "Performing as master of ceremonies for this year's event was Count Basie Theatre board member Siobhan Fallon-Hogan, a Middletown resident...". ^ "Rumson Screen Star’S Character Therapy", Red Bank Green, February 26, 2015. Accessed February 27, 2018. "Expect to see a bit more of her. Beginning this May, Siobhan Fallon Hogan, a Rumson resident of 10 years, will be a regular presence on Wayward Pines, the Fox TV “event thriller” limited series (starring Matt Dillon, Terrence Howard and an ensemble supporting cast) from producer M. Night Shyamalan."